With any ethnic cuisine, you'll need time to familiarize yourself with a new set of ingredients and techniques to understand and ultimately appreciate it. Here are some key ingredients that may not be so common in a typical American pantry, but it's good to know as it pertains to making these Vietnamese Shrimp Spring Rolls. Note, the recipe below doesn't give a set measurement of ingredients to add to your roll. The beauty of this is that you can customize it to your own preference to use the ingredients in the various ratios you want. 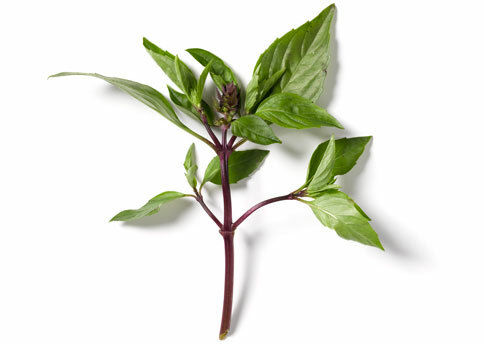 Thai basil, which can be identified by its purple stem, has a stronger flavor and aroma with hints of licorice, cinnamon, and mint. Thai basil is readily available at Asian markets but if you don't have an Asian market or cannot find Thai basil in your area, your best bet is to substitute with fresh mint. Thai basil is more similar to mint that sweet genovese basil which is used in Italian recipes. Vermicelli rice noodle is a thinner noodle than angel hair pasta and is packaged as dry and brittle, requiring a short simmer in boiling water until softened (roughly 3-5 minutes. Once cooked, strain and run under cold water to stop the noodles from cooking. Drain from any excess moisture and use as a filling for spring rolls. This is readily available at Asian markets and in some national supermarket chains. At the store, looking for noodles with the word 'bun' on the packaging and/or check the ingredient list and confirm the noodles are made with rice flour and not bean starch (aka cellophane noodles). Rice paper is a thin rice crepe that is dried and stacked, sold in packages. To use, it must be rehydrated and softened in warm or hot water to make it pliable enough for rolling and filling. Like the previous ingredient, you can find these at Asian markets and some national supermarket chains may even carry them. With a large shallow pan filled with warm tap water, slowly dip the rice paper in the water to rehydrate and make pliable. Place on flat working surface like a cutting board. Working quickly, add 3-4 slices of shrimp just off center of the rice paper in a horizontal line. Top with a few leaves each of the fresh herbs followed by 1 heaping tablespoon of rice noodle. Fold the lower side of rice paper up over the mound of filling, followed by folding in the sides of the rice paper towards the middle. Continue rolling the rice paper to seal - similar to rolling a burrito. Serve with Chinese hoisin sauce (aka Chinese BBQ sauce) and a garnish of chopped roasted peanuts. We're huge fans of Vietnamese foods! I can't wait to try this! I haven't made these in years. They are so delicious and healthy. Need to make them again soon. My kids love these. Can't wait to try your recipe. Thank you! 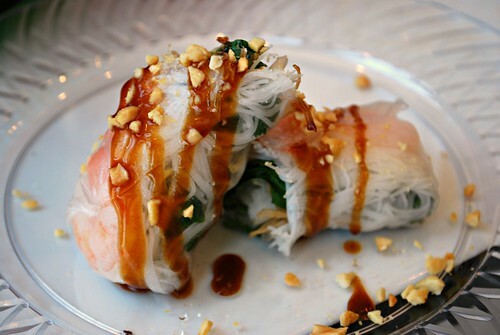 I love vietnamese food - this looks amazing (and cool) to make!